GCU dancers at the Universal Dance Association camp last week at the University of California-Santa Barbara. With a record 32 dancers preparing for a new season, Grand Canyon University Dance coach Jacque Genung-Koch and her team took a different goal-setting approach prior to a pair of critical training camps. 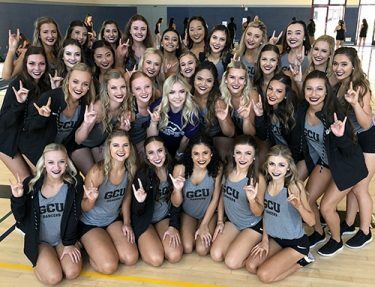 As all five goals were checked off and positive evaluations poured in, the Lopes dancers were beaming with a so far-so good feeling upon their return to campus this week. Each day, the team kept its goals in mind, beginning with being intentional learners. Between the two camps, Lopes dancers learned 38 dance routines to perform at GCU events, including Lope-A-Palooza on Aug. 23. The eight dancers who attended the camp in Las Vegas each won a star dancer ribbon. Fourth-year dancer McKenna Ross, who began dancing at age 2, noted that their brains are programmed to remember numerous choreographed steps. Throughout both camps, the dancers were usually spread out in different classes, so they could learn new routines and teach them to the entire squad. This strategy enables GCU to unveil new dance routines for each home basketball game, and enabled Lopes dancers to meet dancers from other universities. Meeting other dancers, learning their names and making connections became part of their DNA. The third goal played off the second: Encourage each other and everyone around you. Despite dancing most days from 8 a.m. until midnight — with breaks in between — the fourth goal was tied to maintaining a consistently positive attitude amid an incredibly challenging schedule. With hair and makeup preparation and breakfast, most alarms were set for 6 a.m. The final goal was to be a spirited ambassador. While all 32 dancers took part in the end-of-camp competition at the Universal Dance Association Camp at the University of California-Santa Barbara, placing second in Division I, a subset of the team — eight dancers — attended the United Spirit Association (USA) camp in Las Vegas and won the most spirited team award by a vote of other teams. The Dance team poses after practice. The eight dancers who attended the USA Camp showed that they measured up in the Dance Star competition. It started with selected dancers, including all eight from GCU, performing the same jazz combination routine. The top 30 dancers, including four from GCU, were selected for the second round, which was a turn combination. Ten dancers advanced to the final round, which was four eight counts from the original jazz combination routine combined with four eight counts of improvised dance (which was prepared the night before). Ross and Tyra Thompson made the final round — GCU was the only team to qualify two dancers in the final round — and Ross was the star of stars, the Dance Star champion. Through daily prayer each morning and night on the bus and the recitation of a new chant designed to build confidence, both camps provided exceptional experiences for GCU’s dancers. Ashley Vest, Caity Wood, Lindsey Wood, Torie Yoshihara. Contact Theresa Smith at (602) 639-7457 or theresa.smith@gcu.edu.